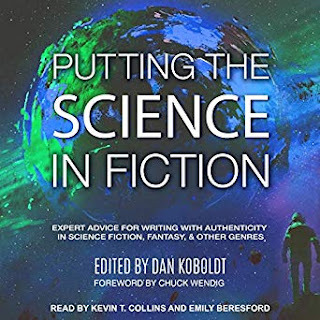 Thrilled to announce that the audiobook of Putting the Science in Fiction -- narrated by the talented tag-team of Kevin T. Collins and Emily Beresford -- is now available wherever audiobooks are sold. It's more than 11 hours of advice from real-world experts on how to craft more realistic and compelling stories. Plus the hilarious foreword written by Chuck Wendig, of course. There's a free sample of the audio on the book's Amazon page.